It’s the 19th century and you’ve just arrived in an unknown land. You do not speak the language and do not understand the customs. You are 13 years old and have signed on to build the Transcontinental Railroad. How much do you think you will get paid? What do you think the working conditions will be like? How long do you think it will take to build the Railroad? First, the students will be introduced to the topic of the Chinese workers' influence on the construction of the Transcontinental Railroad. Next, the whole class will create a KWL chart about the Chinese influence on the Railroad. K- What do the students already know? What can students derive from their prior knowledge and experience about the topic? W- What questions do we want to answer about the topic? L- After their research, what have they learned about the topic? Finally, they will create a concept map using resources from websites such as the Central Pacific Railroad Photographic Museum and American Memory. What was the Chinese experience during the time of construction of the transcontinental railroad? There might be a list of sub-questions that will be asked as well. These are guiding questions to point the students in the direction of answering the main question. 1. How do you think the Chinese immigrants of the mid nineteenth century contributed in creating an environment, which could sustain the rapid growth, and development, which was occurring in California during that time? 2. 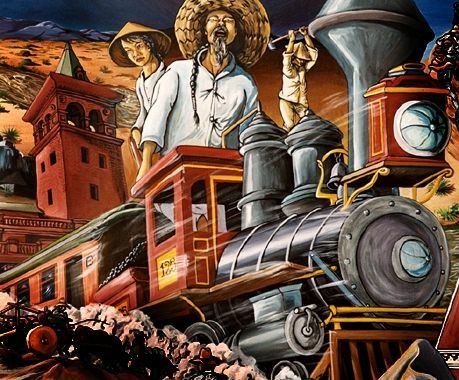 Do you think the Chinese felt that building the transcontinental railroad was a good employment opportunity? Why or why not? 3. How did racism and prejudice affect the lives of the Chinese immigrants living in California in the mid nineteenth century? In order to procede with the investigation, students will add to the KWL chart each day and create a concept map using Inspiration to keep track of their findings. As a class, we will come together and record our individual findings on our KWL chart each day. Each student will be in charge of collecting and adding information to their concept map. Web Inquiry Projects use data/information other people have gathered and placed online. Part of the inquiry process is finding the needed information. * Students will complete the KWL chart as a class. * The students will share their project with the class in a presentation showing their finished concept maps and explaining their findings. * Each student will be required to write about the most interesting thing they found during their investigation. What technologies did the Chinese provide from their homeland that helped them in their experience building the railroad? At what point in history did the Chinese become more accepted into American society?